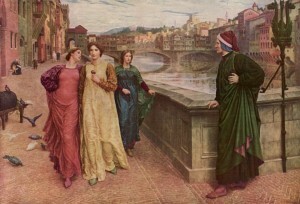 Dante and Beatrice by Henry Holiday. For more information and activities for this painting visit Garden of Praise. I also have a tapestry of this painting. I have acquired a tapestry of Dante and Beatrice. Approx 36 x 48. The tapestry is a monochromatic ecru color-No color like in prints. I haven't seen anything like this. Can you tell me more? about this tapestry? Below are the web sites on the painting. In error, I referred to this image as a tapestry in my previous comment, and it actually is from the oil painting by the Englishman Henry Holiday done in 1883. I have the tapestry based on this painting. Also, the tapestry was more likely done in France not Belgium. This tapestry was made by a Jacquard tapestry making machine in the early 1900s probably in Belgium and possibly in France. It is based on Henry Holiday's painting (1883) that hangs in the Walker Museum in Liverpool, England. To read more about the painting you can google Henry Holiday or the Walker Museum and to learn more about Jacquard tapestry method google that as well. Recently, June 2010, this tapestry sold at auction for $500. Can somebody tell me, why I can not see the larger image? It says I don't have permission. I have an oil on canvass of this painting. I took it to have it appraised, but the appraiser could attach no dollar amount to it. He said it was painted some time during the 15th century. It was given to me by my uncle, who served in (and brought it back from) Italy during WWII. The painting is not invery good condition, due to its age, but obviously is the same as the Henry Holiday painting. I would appreciate any information (or speculation) that could be provided. If any one has any information, please e-mail me. I have the above image of Beatrice on a tapesry held on with some kind of staff or rod that has the eternal flame within it along with the Book of Judd inscribed in it It has vibrant color still within it and for the most part been kept hidden from the weathers elements. I have been searching over and over for any information about this such tapestry Value I.e. ANYTHING If someone could possably direct me as to where I could go for this information I thank you. I live in East Lewis County Randle Wa Thank you R.G. Hi, I have a original Oil painting of Dante & Beatrice. The initials on the painting are 'ab'. My grandfather who fought world war 2 in Italy was gifted this painting by a British Army Officer. I am trying to do some research on this painting. Anyone who has knowlwdge about Dante & Beatrice painting - I would request your help. My email is vijay.saxena2_at_gmail.com. Beatrice. It was published by Reinthal and Newman, NY.